Crouched in near racing positions, we listened as Vicki laid out the rules. My sister, Margaret, two-and-a-half years younger by birth but five older in maturity, looked at me. Something devilish in her smile told me we’d be spending money, running and risking being left in the middle of the tundra. 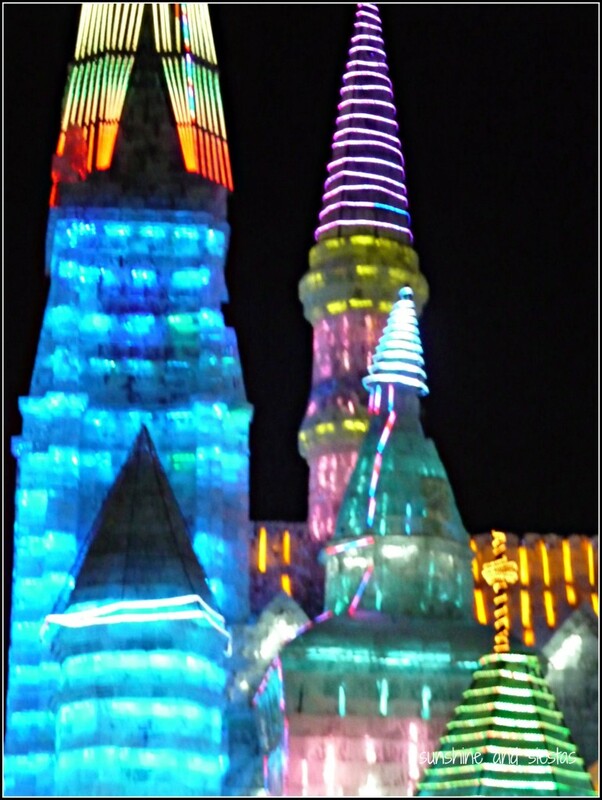 As with the 19 other red puffy coat-clad girls on her synchronized skating team, Margaret took off running, her Ugg boots sliding under her as she headed towards an enormous pagoda, lit up in electric blue and green hues. I followed, suddenly relieved that the less adventurous of us had finally found some cojones. Two minutes lapsed. 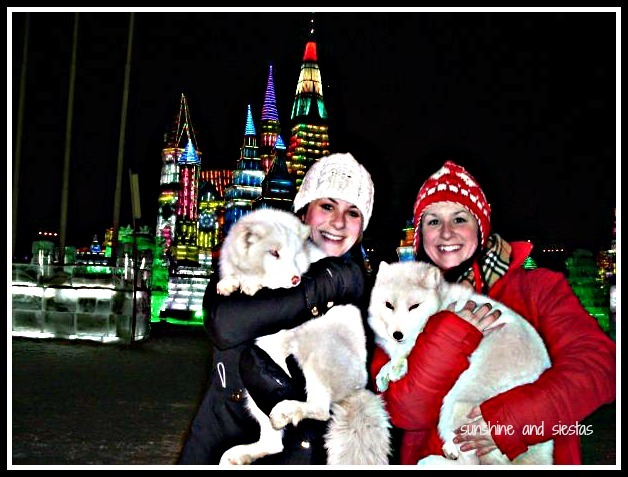 The day earlier, I’d arrived to Harbin, China with my family for the 2009 Winter Universiade, an amateur sports competition. As a member of the Junior Synchronized Skating Team at Miami University of Ohio, Margaret was chosen as a member of Team USA and an ambassador of US Figure Skating, competing against teams from Scandinavia and around Northern Europe. For me and my parents, it was an excuse for an extra stamp in our passports and a two-week break from work. Harbin was a mind-bending mix of Chinese characters and Russian Cyrillic, as Harbin is a mere two hours’ drive from the border with Russia. With a population of the urban area straddling 10 million, the hub of northeast China is European in attitude and character: we’d swapped dumplings for goulash and pulled on all of our extra layers, relying on taxis to take us three blocks for fear of literally freezing our buns off. The Universiade coincided with one of Harbin’s biggest tourist draws (apparently the other is fashion, but all I saw were stouter women and unflattering coats with just the eyes and tip of the nose peeking out of the hoods). 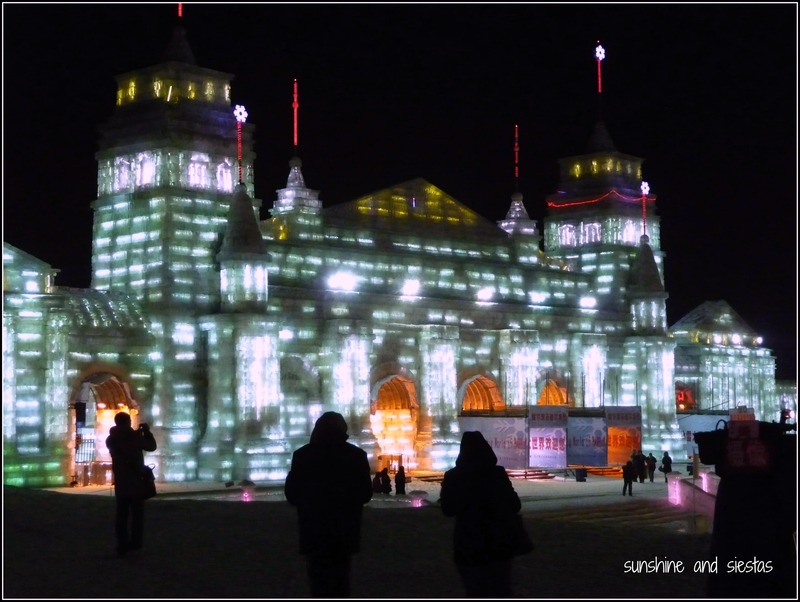 The Harbin International Ice and Snow Sculpture Festival is considered one of the top winter festivals throughout the world, with artisans perfecting their craft around the world and creating hundreds of sculptures in winter weather that hovers just about 0°F. Fearing my sister would twist an ankle or knee and be unable to skate, I begged her to slow down as we reached the pagoda. Margaret had other plans, as she scrambled up a set of stairs carved of snow and slide down an ice slide. 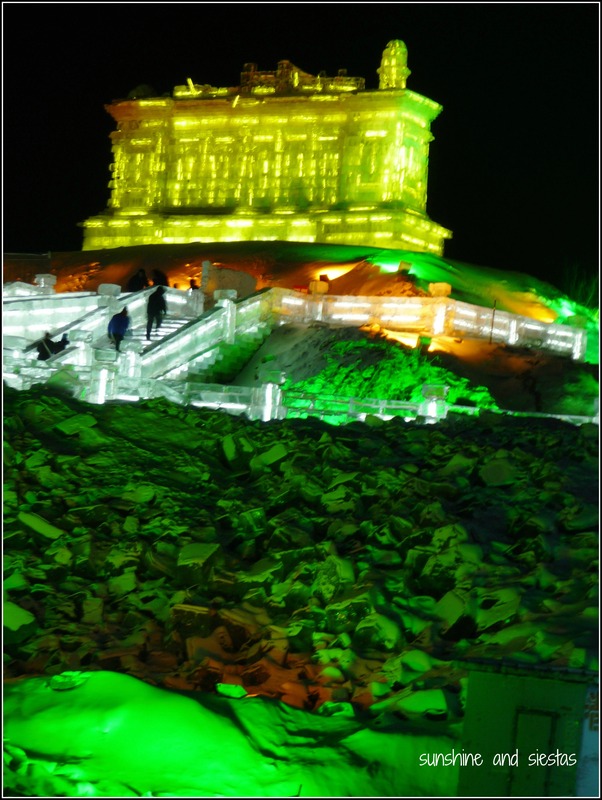 I followed suit, and we ran from the pagoda to a giant Buddha, an ice castle and various other Chinese landmarks immortalized in ice that had been excavated from the Songhua River and lit up with bulbs frozen right into the blocks. 14 minutes lapsed. That afternoon, my family and I had also toured the Zhaolin Gardens between Margaret’s training breaks. Snow from the city’s Sun Island park had been sculpted to create a replica of the Bird’s Nest from the Beijing Olympics, animals and even a gigantic spider. Like a child, I was captivated as the lights fell at 4p.m. and the statues took on an eery glow from the help of flood lights. My sister pulled out a fistful of yen notes and waved them in front of my face. “Miami gave me bills, let’s take our picture with some Step Arian wolves.” I glanced at my watch. 18 minutes lapsed. Two fluffy white wolves, no larger than a beagle, huddled close together under heat lamps in front of a stand selling candied apples. Vicki could shove it, for all I cared. We only had twenty minutes to witness one of Asia’s most beautiful festivals, a product of a harsh coach not wanting her athletes’ ankles rolled or muscles pulled. We handed over a few yen and squinted against the lights that set the park aglow. 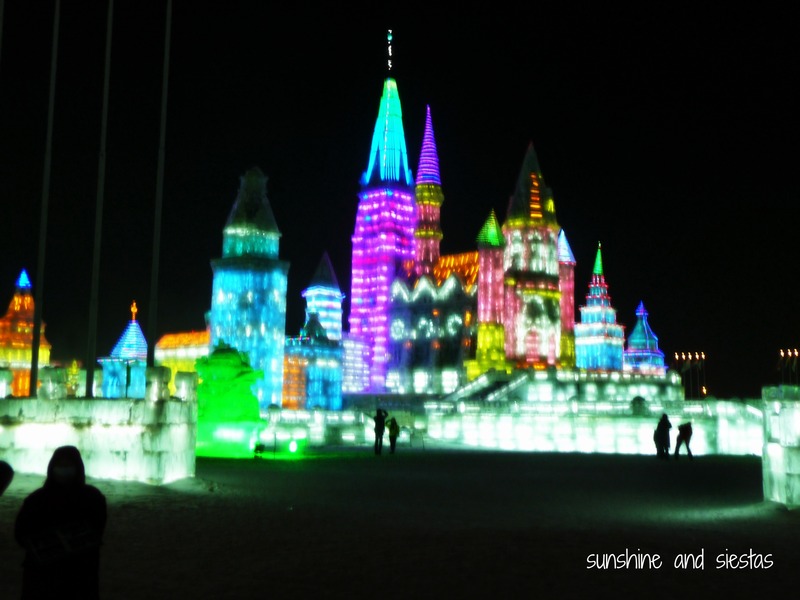 If you go: The Harbin Ice Festival is an annual event that takes place between December and February, with the official kick-off on January 5th. We were fortunate to be there in the first place, but our trip was towards the end of February, and some of the artwork had suffered damage and melting. Harbin is also one of the foremost producers of beer in China, and simple leaving it out near your windowsill ensures it stays cold! I lost all of my pictures from Harbin, so these shots were taken by my father, Don Gaa. For the BBC’s report on the 2009 festival, click here. Have you been to a famous winter festival? Leave me a message in the comments!